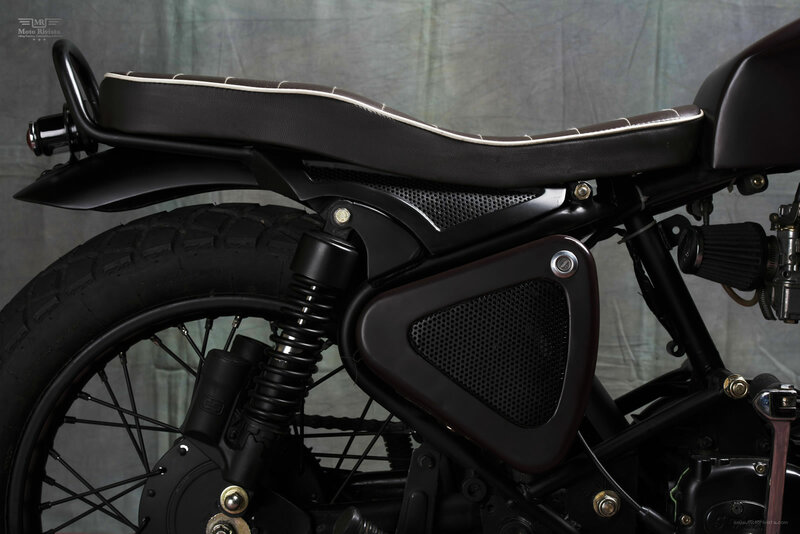 We are always excited when we hear from a new custom shop because it signifies growth for the motorcycle culture we are passionate about. Having only recently returned from a month long trip in India and seeing motorcycles everywhere, I am not at all surprised to see more and more custom shops popping up. 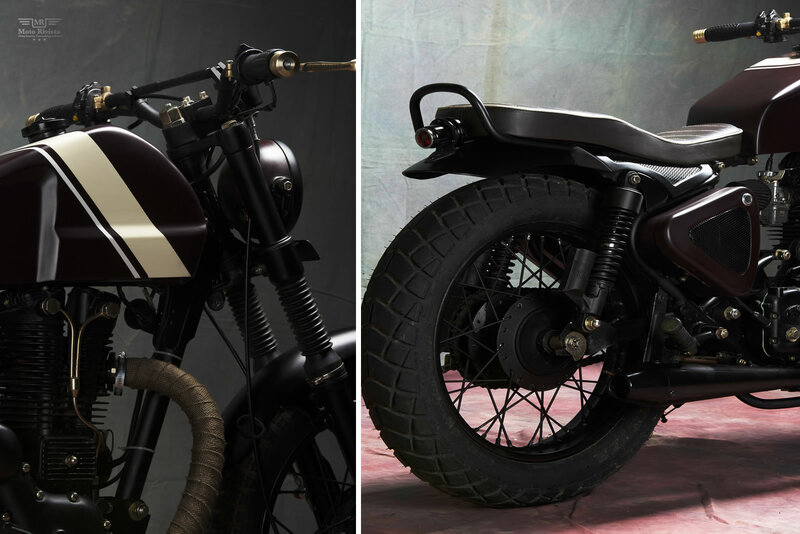 With 1 in 25 Indians on 2 wheels there is plenty of stock in need of customization or restoration! 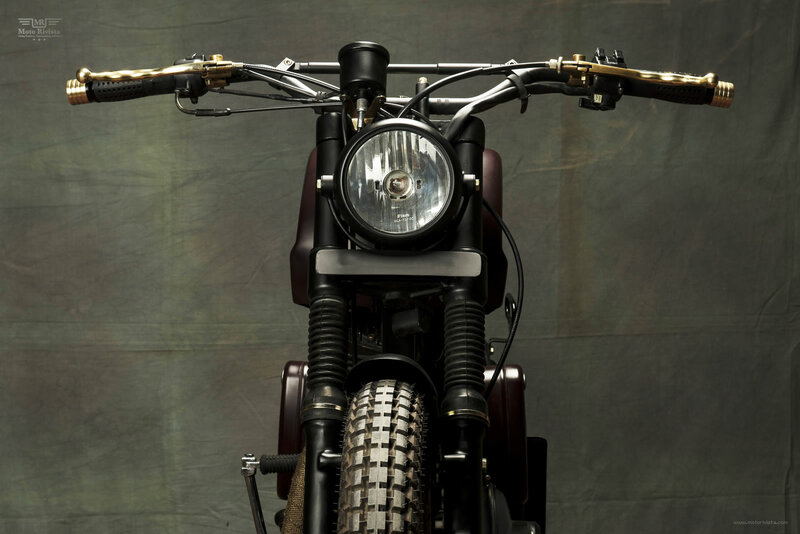 Without further ado let me introduce you to Bull City Customs and their custom Royal Enfield Scrambler. “Hi this is Reginald Hilt from New Delhi India. I am a fashion designer by profession and I run a buying agency for the Japanese market. I would consider myself a new kid on the block, as this is only the second legit build I’ve completed. Motorcycles have always been a force in my family. When I was a kid I would see my dad every weekend cleaning a filter or tuning a carb on his bike. At that time I wasn’t really into the motorcycle culture. I’ve seen bikes like Rd 350, Yezdi, Yamaha RX 100, Rajdoot, Suzuki 125 roll in and out of our place every 6 to 7 months depending on how long it took my dad to get over these bikes and crave his next indulgence. It wasn’t until after I was done with college and I started working that I really got hooked on this culture and now I feel it is my life. I started modifying bikes in 2011 and there was no looking back. We are called Bull City Customs. We believe in unity of like-minded people who follow the same passion – creating something unique! My wife Naavika, who is also a designer, has designed a range of graphic tees for bikers and also handles the marketing of the biker merchandise we plan to introduce in about a month or so. A friend Henry, who we met at one of our bike build meets, now helps us out with logo designing, branding, 3d sketches etc. This is a 350 cc Royal Enfield Machismo 2003 AVL Engine 5 speed. The bike went through a complete over haul. Outside a garage I used to visit for my bike work it used to be tied with chains to a lamppost on the ground with a bent chassis and a broken front suspension. I built this bike for my wife as she was always complaining she couldn’t sit with me on my bike because I had turned my bike into a single seated Bobber. About 4 months ago I picked up this bike and decided to build a Scrambler. Firstly I sketched a few options. 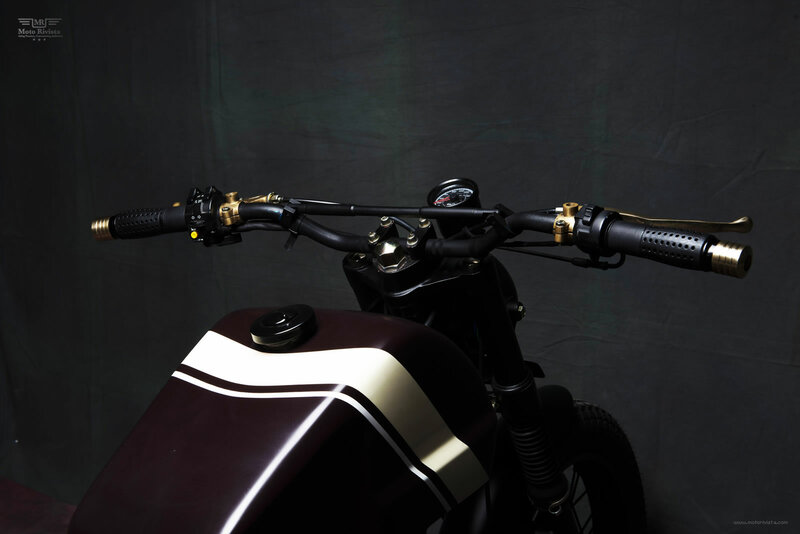 After the design bit was over, it didn’t take me much time to work on the modifications as I knew the scrambler would suit her profile and I felt the Royal Enfield had the perfect frame work for it as well . 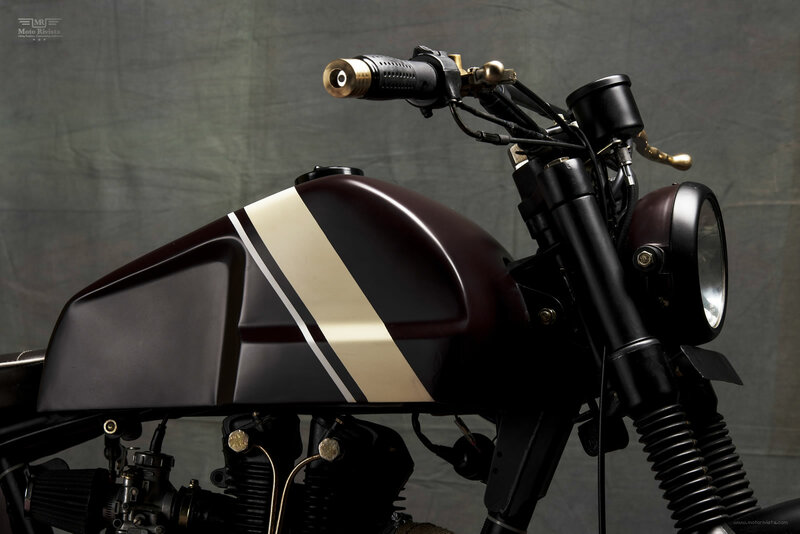 The most recent of Bull City’s two-wheel custom work, manages to transform one of the world’s most popular motorcycles into a custom dream machine worthy of any garage. The Royal Enfield has been toyed and tampered many times before. It’s an old favorite to work with; being one of India’s biggest selling motorcycles for over three decades. So you’d think that the platform might just have been exhausted. If so we have pushed the boundaries to create a classic thumper with a streamlined, modern edge. The challenge we faced was achieving that comfortable scrambler posture of the chassis of a Royal Enfield. It was a good decision to use that filler above the tool box to achieve that horizontal position in line with the bottom line lines of the fuel tank. We love the way the tool box looks now with the mesh work, making it look really light and cool. 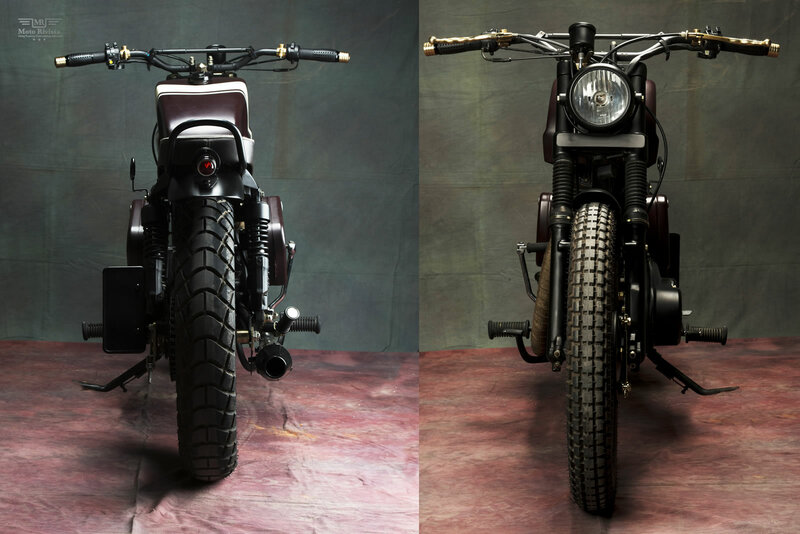 Our favorite though is the way the tank turned out to be really boxy whilst still maintaining the consistency of the lines from the T at the front to the seat at the back. The grips on the bars also turned out to be really cool, I managed to get a pair of old grips and blend them with these brass weight’s at the end of the grips to match the clutch lever and the brake lever. 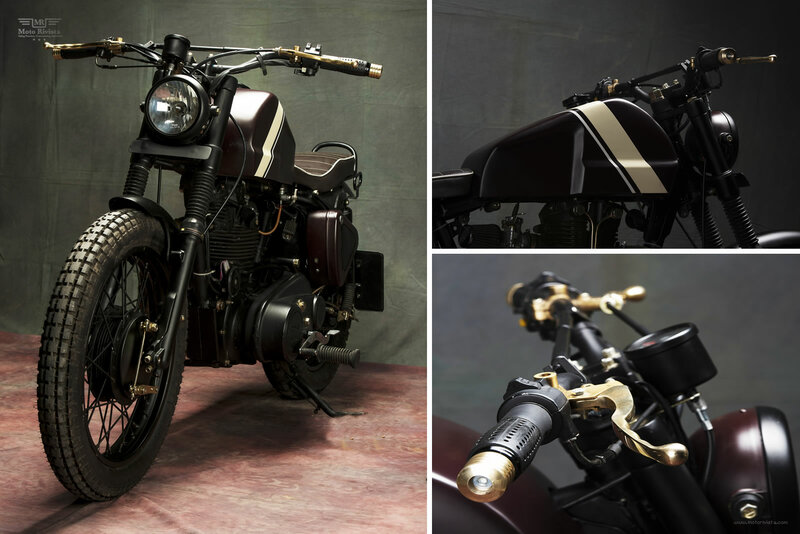 The paint job is fairly simple the tank, tool box and the head light is a wine brown matt finish and the black you see on the engine, wheels, handle bar and the mesh on the tool boxes are powder coated. 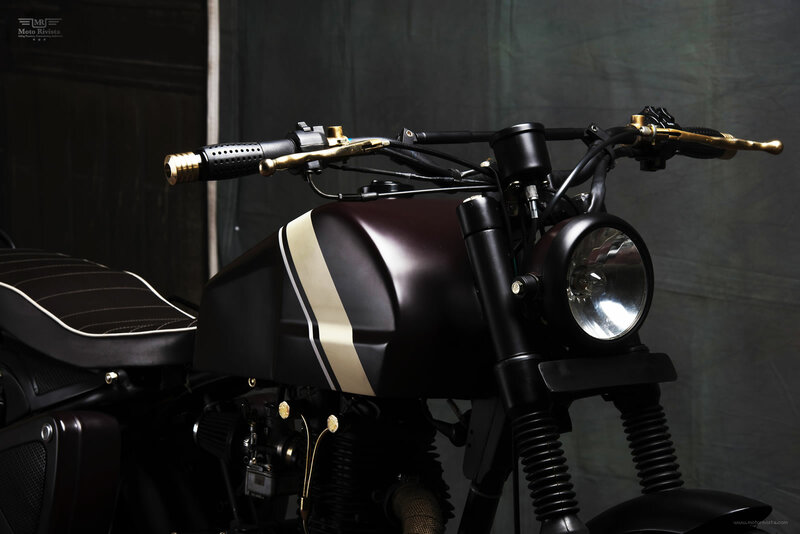 We would term this build to be a Street Scrambler. We have taken this bike out to the foothills of the Himalaya’s recently and it handles pretty awesome.